Thailand, Southeast Asia's tropical kingdom of endless smiles, is divided into 76 provinces and three distinct states of mind. The first: "bustling," epitomized by always-buzzing Bangkok, the vibrant southern capital seemingly held together by its steamy food carts, dazzling street life, and bewildering contrasts. The second: "stately," embodied by Chiang Mai, the northern capital, where ancient temples and quiet monasteries dot the skyline and the all-enveloping rainforest is just a short drive away. The third: "serene," felt most strongly stretched out on the white sands of a Phuket beach at the country's southern tip. Thailand's diversity of moods is precisely what holds it all together. Come make yourself whole. There's no better introduction to Thailand than Bangkok. 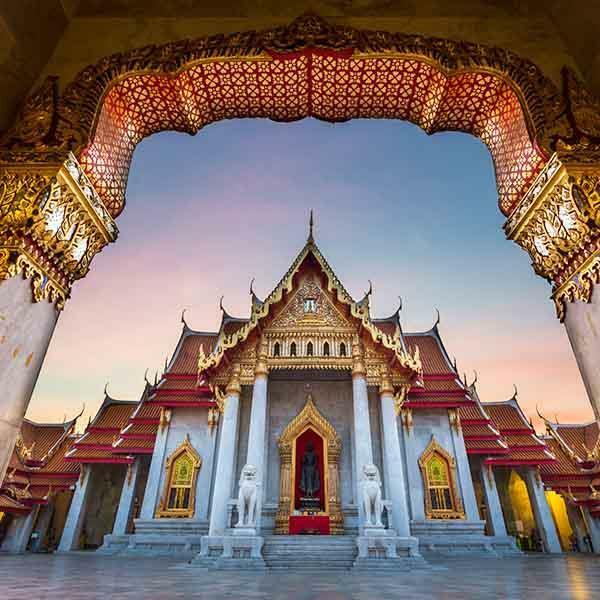 Here, you'll spend a full day exploring the busy capital's sights, from an early-morning visit to Wat Suthat to beat the crowds to a longtail boat ride through the city's vast network of canal-like khlongs. Later, climb the 300 steps (or take a cable car) to the stately Doi Suthep pagoda for incredible views of Chiang Mai, meet the patients at a elephant rehabilitation hospital, stroll through the temples and wats of Lampang, and haggle for souvenirs or chat with Buddhist monks on a private morning tour of the local markets. Finally, fly south to Phuket and paddle the impossibly clear waters of Phang Nga Bay by sea canoe before devoting a full day to exploring on your own or doing as little as possible on the beach. Fast, slow, or paused, Thailand moves at the same speed you do.